Halesworth Station on the East Suffolk Line was built on its present site in 1859. As rail passenger traffic grew and trains became longer the platforms at Halesworth needed to be extended. Due to space restrictions and the topography of the land to the south of the station, the platforms could only be lengthened on the northern end and as the main Halesworth to Bungay Road crossed the railway on the level immediately at the end of the platform special gates which included the end of the platform extensionswere built across the road. this was done in 1888 and effectively doubled the length of the platforms to accommodate longer trains. These four seven ton gates were manually operated but the opening and closing was controlled by a lever in the signal box which locked the gates in place to prevent trains accidentally running into them. The gates two on each side of the railway were constructed from lattice frames and wooden platform surfaces. Each gate was pivoted at one end and balanced in such a way as to make it easy to be open and closed by one man. The weight of the unpivoted end was carried on small wheels which ran over the raised road surface of the crossing. Two smaller moveable sections of the platform were provided, one each side of the tracks and opposite each other, to enable pedestrians and cyclists to cross when the gates were closed to road traffic. Many photographs show the main gates in the closed position to the railway and in this way two gates could be used as a bridge across the tracks to enable luggage to be pushed from one platform to the other on the level. The gates were renewed in 1922 by Boulton & Paul and the makerâ€™s plate confirms this. 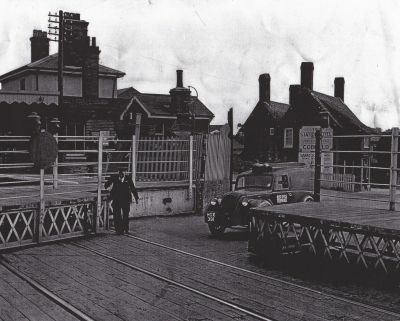 This unusual and unique level crossing was in use until about 1958 when the increasing local road traffic made it necessary to build a new Halesworth to Bungay Road on a bridge over railway further to the north of the station. In later years lack of proper maintenance made the pivots difficult to move and soon it required the stength of three men to operate them. The gates, now unused, remain in situ and in 1999 as part of the refurbishment of the station area, they were cosmetically restored although the road surface over the tracks has long since been removed. We have a working model of the Movable Platform in the Museum entrance.